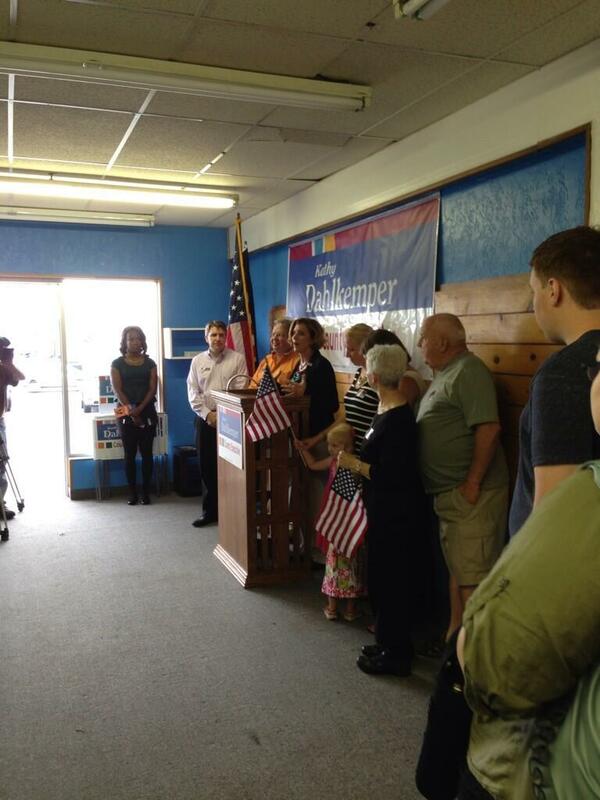 Democratic candidate for Erie County Executive Kathy Dahlkemper announced the opening of her new campaign headquarters, located at 831 W. 38th St. today. She said the location would serve as the central hub for her operations as she gears up for the November 5 general election. The former congresswoman, who defeated one-term Democratic Incumbent Barry Grossman in May's primary election, also announced Mike Moser as her new campaign manager. Moser previously worked on the campaign for Democrat Chris Dietz, who lost the bid for Pennsylvania state house representative for 104th district to Republican Incumbent Sue Helm, as well as the campaign of Daniel Miller, who is the current Harrisburg City Controller and was a former member of the Harrisburg City Council. "I think she's the right woman for this job, and I want to make sure that happens," the Berks County native said after Dahlkemper's announcement. "She has a lot of potential here in Erie." Before the announcement though, I had the chance to talk to Dahlkemper about why she's now establishing a headquarters rather than relying solely on the mobile headquarters she employed during the primaries, what it'll take to defeat Republican challenge Don Tucci, and a bike tour she plans to embark on around Erie County. Ben Speggen: During the primary election, you had a mobile headquarters. Now you've chosen to establish your headquarters here at 831 W. 38th St. Why the change? Kathy Dahlkemper: We decided we wanted to have a place where people could actually come to get a sign, pick up literature, and make telephone calls. The mobile headquarters were great – actually, we're continuing that, and I will do that in a lot of different forms. We'll be doing a bicycle tour of the county, and I will be having the meet-and-greets throughout the county like we did [in the primaries]. But what we really found was that people want a tangible place where they can come to. And it helps create the excitement and the energy of the campaign, so we've decided to do both for the general election. BS: A bicycle tour of the county? Tell me more about that. KD: In mid-September, I will be biking the parameter of the county, leaving Erie heading out towards Fairview, Girard, up to Albion, over to Edinboro, into Waterford, Union City, Corry, down through the eastside down to North East, and then back into Erie. What I want to do is highlight some businesses along the way that maybe people don't know exist in Erie County – stop in and make a visit to those businesses, stop at local eateries for my meals, and stay overnight at a bed and breakfast or wherever I end up that night in those communities. I want to highlight the fact that Erie County is more than just the lakefront – it's a county that has a lot of diversity; it has a beautiful countryside and great businesses. If it goes well, I want to make this an annual event where we can encourage bicycling in general, because it's a great attraction for tourism. People like to go places where they have a bike-friendly environment, and I want to make Erie County more bike-friendly. BS: Since the primary elections, where you defeated Democratic Incumbent Barry Grossman, what would you say have been your biggest accomplishments? KD: Since the primaries, my first accomplishment is staying positive, staying on that positive message focused on the issues that are of concern to Erie people. Second, is continuing to build on relationships that I talked so much about. I've had a lot of meetings over the last few months with people from all different sectors, whether it's those from in the economic development side to those in the business side to those social services to public safety – just again: Listening. This summer was a listening tour for me, trying to hear more about the issues that face our county, so that as we go into the general election, again I can stay on the issues with even a greater knowledgebase. BS: What do you think are the things you need to do from now until the general election to defeat Republican challenger Don Tucci? KD: Number one is to have a great field operation. I did that in the primary election and I will do that again – that's targeting those voters that we know will come out in this off-year election and going right to them. Secondly: staying on message and keeping a positive campaign. People are tired of the negative campaigning. Mr. Grossman and I stayed very positive in the primary election and I think people really appreciated that – so staying on that positive message and staying on the issues. And third, increasing the base of support that I have.